Engadget Distro is ready for download! You've been waiting patiently, we've been waiting impatiently, but now all that waiting is over. Engadget Distro is live and we can't wait another moment for you to download and give it a try. If you missed our introduction a few weeks back, Distro is a distilled version of the best feature content each week at Engadget. We know your life is crazy. We know you don't always have time to read everything good that comes through our feed. That's why we've created this. Now, every Friday morning, you can download a new issue to your device and then kick back, take your time and enjoy the best reviews, previews and other long-form content that slipped through your fingers during the week, all reformatted and redesigned in beautiful, magazine-like layout that we think you're going to love, and it works completely offline. We're also mixing in some exclusive content found only in Distro, like an editor's letter from yours truly to get you up to speed on the week's news. Don't miss the weekly comic, hand-crafted by a selection of some of the most talented artists in the industry. And, every now and again, we'll be surprising you with a special edition issue just to keep you on your toes. Now, this first release is iPad only, but trust me when I say we're already working to get this out on other platforms. That doesn't mean you sweet Honeycomb users, playful PlayBook owners and bargain-hunting TouchPad touchers can't get in on the fun sooner. We'll be offering PDF downloads on Friday with each new issue, meaning you can read along on just about any platform you like. So, we're hugely excited to be offering up Distro. It's a beautiful new way to read Engadget and it's been a massive project, the culmination of many late nights by a team of talented designers, developers and editors, all of whom I personally owe a great deal of gratitude. 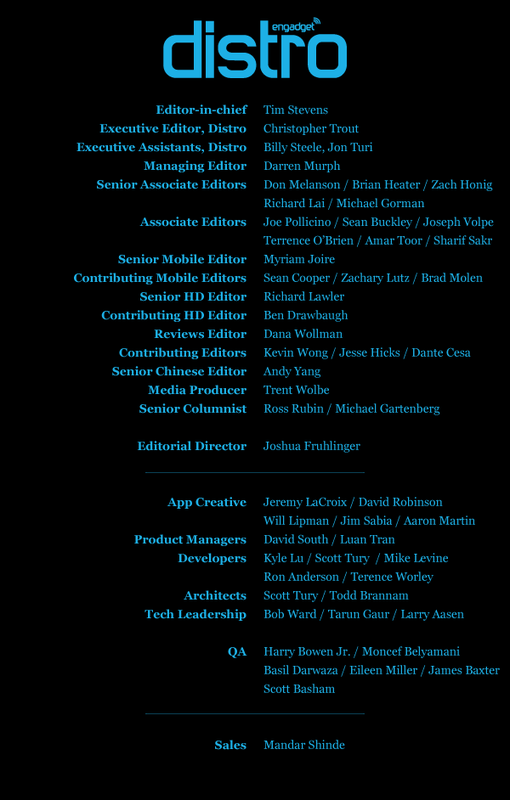 Their names are listed in the masthead after the break so, before you go download, take a moment and check that out. Then, get your d/l on and enjoy the selection of back-issues (six!) we've provided for you. On Friday, get ready for a fresh edition. They're all free and they all come with love, from Engadget. p.s. If you're wondering why Distro is not in Newsstand, during development we were told that you can't include free downloads in there, and we definitely want this to be free! It seems like that may be changing, so we'll look to add support there when we can. p.p.s. We're told the app is crashing for some of you on some of the pre-release betas of iOS 5. We're also told iPads set to the German language could be crashing as well. We're working on a fix for this. If you have a bug to report, please hit us up at support at engadget dot com with your iOS version.